Whether it’s out and about enjoying the great Newfoundland outdoors, or inside in the always bustling NTV newsroom, these three ladies say that life just couldn’t possibly get any sweeter; unless co-worker Eddie Sheerr could rustle up more snow days, that is! NTV’s Jodi Cooke, Leila Beaudoin and Kelly-Anne Roberts, share a few common goals. For one, all three love what they do for a living, and each share that working for NTV has been a dream come true. But what they also have in common is a love of the great NL outdoors, and any chance they get to get out and enjoy, they do just that. 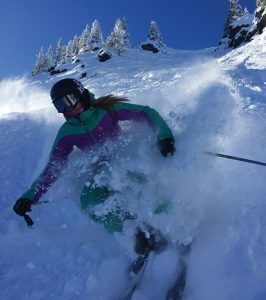 While Jodi Cooke is the always polished co-anchor of the award-winning The Sunday Evening Newshour, the province’s only televised weekend news broadcast, she also polishes something else; her skis. “I love being on the slopes. If I wasn’t on television, I’d be doing something with skiing, like coaching. It’s one of my passions,” she shares. Not that Cooke doesn’t also enjoy chillin’ in her downtime too. “It’s the simple things I enjoy most,” she says with a smile. Living in the country these past two years has really changed her perspective on herself and her personality, she adds. “There’s this recognition that I am an introverted extrovert. I’m with people all day – Monday through Friday – and I love that part, but I also like to completely shut down and shutting it off and having no cell service and not speaking at all for two days a week,” she shares. So, what would one do while shutting off, we ask. Her reply? “Nothing. Lots and lots of nothing. It’s just a wood stove and a rocking chair. Maybe (husband) Dave and I will walk in the woods or walk to the beach or do some ice skating. We may collect some drift wood or split wood. It’s a dream life. Work is what I have always wanted, and my downtime is what I never knew I wanted, but I always sort of needed,” she shares candidly. 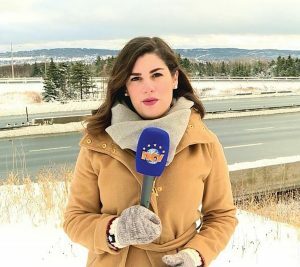 Leila Beaudoin grew up on the Northern Peninsula. “There, we would snowmobile as often as drive a truck or a car in the winter months. 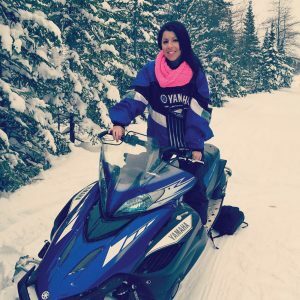 At times there was so much snow I’d go to school on snowmobile, or else I wouldn’t get there,” she says with a smile as the memories come flooding back. Now that she’s a busy reporter with NTV, life has changed a little, but she still seizes the opportunity to enjoy what she loves as often as she can. “The beautiful thing about this company is that we are island wide, so connecting with people and stories around this province is key. I get to pitch stories that can get me to the Northern Peninsula at times and that’s my opportunity to get in the back country and go sledding,” she says. 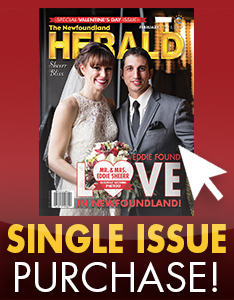 One thing Beaudoin is quite proud of is her weekly Thursday feature, Inspiring NL. “It’s very rewarding, I have to say. In this industry, there’s many difficult stories you have to tell, and it’s a unique job because you often take a lot of what you cover home with you at the end of the day,” she says. “I’m a country person. I love going to a cabin or cross country skiing or having fires or hiking or snowshoeing. It’s difficult at times to find the time, but I love the woods. It’s my favourite place and this winter is especially great for getting outside I love the snow, and there’s lots of it this year,” she says. Roberts shares she doesn’t remember a time when she didn’t love lacing up her skates. “September came around and it was practice time, and I loved it,” she says. 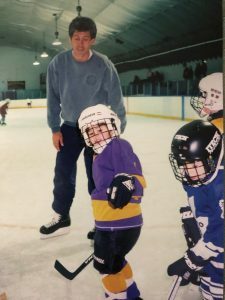 Hockey earned Roberts a scholarship and she played throughout college. Another interesting thing about Roberts is that she grew up playing mostly with boys. In fact, even today, she’s the only female on her Thursday evening for-fun hockey team. Roberts says sports not only kept her active, but it also is a huge part of her social time as well. “Conversations in the newsroom, it could be with Mark (Dwyer, News-director) or Tony (Barrington, cameraman) always involve sports. Who had a big night in sports? We talk a lot about local sports and players; from the Edge to the Growlers, and we say how well the teams are doing. I talk with Eddie (Sheerr) about rowing or golf. Did you see this game, or did you catch that play, is part of my morning conversation,” she says. Roberts, who moved back to this province to take a full time position with NTV, says that being here is a life that’s come full circle. Cooke, who is preparing to head out on vacation soon after we speak – going where else? Skiing – says she couldn’t be more thrilled with how life has turned out both career and leisure-wise. While there’s no direct response, the air is filled with positive back-at-it attitudes. Go get ‘em ladies!